This artist's impression shows the remarkable planetary system around the sun-like star HD 10180. Astronomershave discovered a group of at least five planets ? with hints of two more ?circling around a star in an arrangement similar to our own solar system. Confirmationof the extra planets would make this the highest tally of alien worlds everspotted around a single star. The planets and their own sun-like star are about 127 light-years from Earth,astronomers with the European Southern Observatory said. It is one of just 15planetary systems known to have more than three worlds. Thefive planets circle their parent star, HD 10180, in a regular pattern like theplanets of our solar system, only in a more compact arrangement, theresearchers said. "We have found what ismost likely the system with the most planets yet discovered," astronomerChristophe Lovis, lead author of the study, said in a statement Tuesday. "This remarkablediscovery also highlights the fact that we are now entering a new era inexoplanet research: the study of complex planetary systems and not just ofindividual planets. "Studies of planetarymotions in the new system reveal complex gravitational interactions between theplanets and give us insights into the long-term evolution of the system." The research was announced atan internationalcolloquium on extrasolarplanets at the Observatoire de Haute-Provence, France. It camejust days ahead of a scheduled announcement from NASA's Kepler planet-huntingmission to discuss an "intriguingplanetary system." Lovisand his team used the planet-hunting HARPS spectrograph instrument on a3.6-meter telescope at the European Southern Observatory in La Silla, Chile, todetect the system in the constellation Hydrus. Theinstrument allows astronomers to measure the movement, or "wobble," ofa star caused by the gravitational pull of planets orbiting around it. Thefive strongest wobble signals were caused by planets with masses similar toNeptune, between 13 and 25 times the mass of the Earth. Thoughthese planets are relatively large, they are located close to their parent starand race around at intervals that range from just six days to 600 days. Theclosest planet is not quite 5.6 million miles (9 million km) from HD 10180,compared to the 93 million miles (150 million km) separating Earth from the sun,a distance also known as an astronomical unit. The distance of the farthest onefrom its star is about 1.4 AU. ?Whencompared to our solar system, all of these planets would fit inside the orbitof Mars and appear to have nearly circular orbits. Thewobble method for detecting alien planets also suggested more worlds areorbiting HD 10180, one of them up close and the other far off. "Wealso have good reasons to believe that two other planets are present," Lovis said. Oneof these extra planets, if confirmed, would be much like Saturn, with at least 65times the mass of Earth and year that lasts 2,200 days. Theother potential planet is the most tantalizing for astronomers. If confirmed, itwould be the least massive world ever found outside our solar system, with amass just 1.4 times that of Earth. 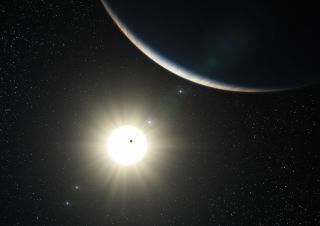 It is thought to orbit extremely close tothe star ? just 2 percent of an AU ? and completes its circuit inonly 1.18 Earth days, researchers said. "This object causes a wobble of its star of only about3 km/hour? slower than walking speed ? and this motion is very hardto measure,"said study team member Damien S?gransan. Thisplanet would probably be a small, rocky world similar to the hellish planetCorot-7b, which orbits close to a different star. There the daytimetemperatures can reach 4,000 degrees Fahrenheit (2,200 degrees Celsius), with nighttimelows of minus 350 F (minus 210 C). Thenewly found system could set the extrasolar record for most known planets. Itcurrently shares the record with the system around the star 55 Cancri, whichhas five planets, two of them gas giants. Nogas giants seem to be present in the HD 10180 star system. "Systems of low-mass planets like the one around HD10180 appear to be quite common, but their formation history remains a puzzle," Lovis said.